Last night the Games opened on the Gold Coast, there were a few countries where the males wore skirted garments as a part of the team uniform, most were countries from the Pacific islands. And they looked good. The first team out on the parade of nations was Scotland, all of their athletes were wearing blue kilts, the women wearing two to blue kilts with purple in the pleats. 6ft3Aussie wrote: The first team out on the parade of nations was Scotland, all of their athletes were wearing blue kilts, the women wearing two to blue kilts with purple in the pleats. 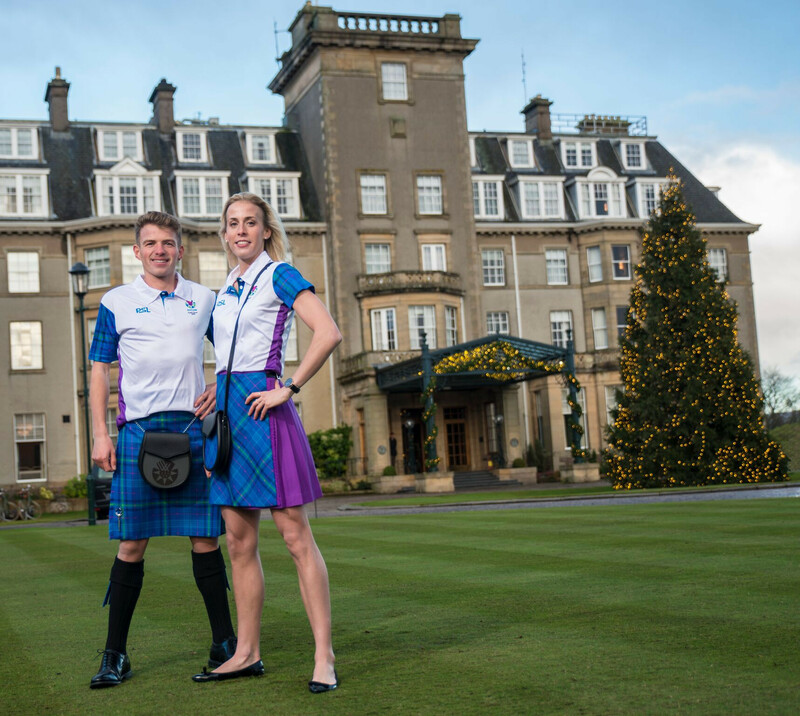 the women wearing two to blue kilts with purple in the pleats. Something similar to this except change kilt color to blue ? Yes, from memory, a blue tartan with possibly a similar purple tartan in the pleats. I prefer the style on the right. Either she's a lanky lassie of he's a short wee laddie. The 'Heritage of Scotland' tartan has blue & purple in it. That’s Gleneagles Hotel. It’s a nice part of the world to visit. The kilt does look very smart. I have always had a bit of a hang up when it comes to kilts, though. To me, they are highly culture specific and I have no Celtic blood, so far as I know. In wearing one, I would feel like someone wearing medals to which they were not entitled. I know there is a tartan designed for my family name. Although I have no knowledge if I am in any way related to those who originally commissioned it, I wouldn't be averse to wearing a garment bearing that pattern. But the kilt itself seems to me to be part of another nation's heritage and I would feel a fraud donning one for that reason. Stu wrote: The kilt does look very smart. I have always had a bit of a hang up when it comes to kilts, though. To me, they are highly culture specific and I have no Celtic blood, so far as I know. In wearing one, I would feel like someone wearing medals to which they were not entitled. I have the same issue with kilts as Stu. Intellectually I know it's rubbish, of course, but nonetheless it persists. I definitely like the designs in that photograph, however, and would wear either if not for the hangup about appropriating someone else's heritage. Must be the perspective of the photo. They're nearly the same height. He's actually a centimetre taller than her, according to Wikipedia, at 1.75m. Which is between 5'8" to 5'9". Here's the story which I linked the photo from.